with a soft snap, showering and whispering. Driving behind Lake Siskiyou, up into the mountains, Bruce and I collect more rock for a project: the construction of a rock retaining wall protecting the stairs that go up behind the house to the second level where the bonsai are arranged under shade structures. Cliff brake fern, Pellaea, and sword fern, polystichum, are emerging from their summer dormancy after a brief rainstorm. We want slickenside rocks because they stack well. These are made of serpentine which is plentiful in this area. It's a light green, shiny and smooth, with a milky finish or sometimes translucent. Also sharp, it can cut. We' finish harvesting apples and transforming them into quarts of apple pie filling or pancake syrup. It's down to freezing over night. The leaves turn red and yellow. The tomato plants are pulled and hung in the shed, the fruit slowly ripening. It should be warm today, in the eighties, under a turquoise blue sky and a breeze so soft it cannot ring the wind bells. Jay Daar was one of the artists selected as Artist- in Residence at Whiskeytown Lake for the 2012 season. She paints in plein air in spite of the rapidly changing light because she love the outdoors. She is influenced by the simplicity and joy of Matisse. One of her paintings are in Whiskeytown National Park's permanent collection which they hope to put on display this year. The park superintendent especially likes that she captured the look of the knobby pines. I got an old Grand Prix. It has a few problems though after I bought it, but now I've already fixed it. It's running pretty good now. Just came back from our man trip to smoky mountain with three of my friends in the church, it's been a very nice trip . We were good friends, they influenced me a lot, what they think and what they believe. Though sometimes I feel it's conservative since I grow up in China which is more like the city life. Well I hope it's a good thing. I took a weekend to visit my old school chum, tongxue, Sharon, who lives in Kelseyville, Ca. That's in Lake County near Mount and Lake Konocti. We tootled around, visiting Fort Bragg, and Mendocino. We got great massages at the Bamboo Garden Spa and tasted wine at Parducci's near Calpella. Upper Lake's darling historic district was groovin' with a guitar duo in the courtyard of the Blue Wing Saloon. 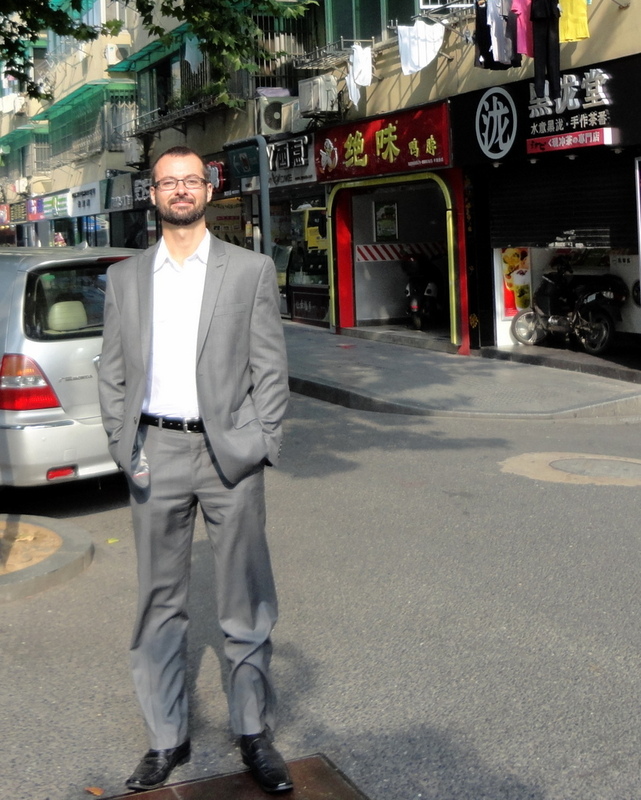 Here's the picture of my son in Shanghai I meant to send in the last blog post. What inspired me to start the Breakfast Letter? I traveled to Beijing to work at Tsinghua University Overseas Promotion Department which is like media communications. I wrote the first blog in February 2011. When I returned to the US, I changed the title and continued on with Dunsmuir Breakfast Letter. Over the years, people asked, why am I publishing my blog as an ordinary email with jpg. attachments for the images? Now I can say, I'm broadcasting on a new website, cherylpetty.com. All the blogs, back to the beginning, are there, archived with their images. Also, new pages on Chinese penjing and my novel, Beijing Abduction, are up and running. This makes the Breakfast Letter blogs available on the wide web. It is possible to subscribe or unsubscribe and for you to spread the word to your friends. This is the last post from California. I'm traveling back to China for the next couple of months and will be blogging from there. Adventure ho! While I am in China, I will visit places mentioned in the novel, Beijing Abduction, which will launch next spring on Kindle, when I return from China. When it is day in China, it is night in the US. In the morning, when you are relaxing with CNN or Fox and a cup of tea or coffee, reading your inbox or RSS feed, the Breakfast Letter will greet you with a new story, a new set of images, and a distracting romp.